Something old...something new...something borrowed...something blue. For me those things are being represented by my wedding dress (which used to be my mom's), either my veil, shoes, earrings, or tiara (all are new so...*shrug*), an old rosary that the women in my family all hold for their wedding day and...my beautiful blue garters from Glitz and Garters! 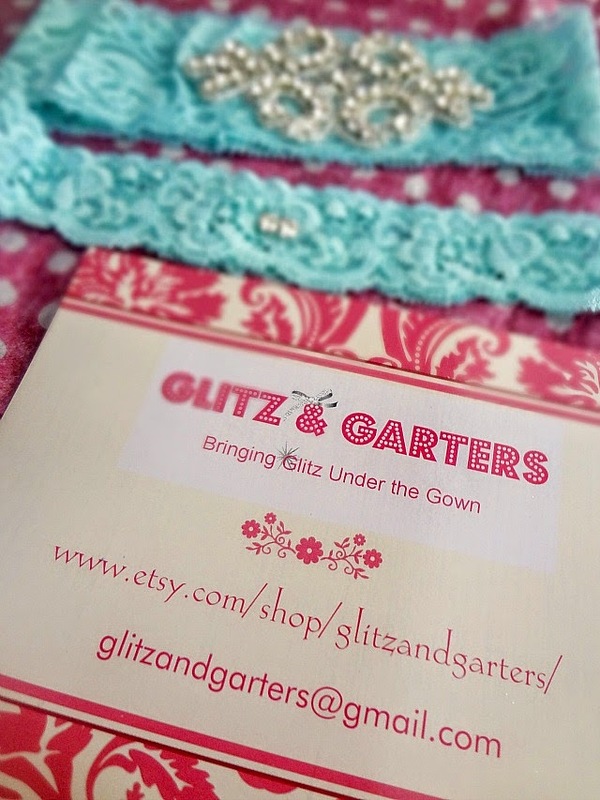 Glitz and Garters is an Etsy shop that sells, you guessed it, garters! Ranging in price from $19.95-$39.95 (and that includes 2 garters--one of which would get tossed during the garter toss! However, if you are not doing the garter toss or are not interested in keeping a garter, you can also get just 1 garter at a reduced price) these are by far the most reasonably priced, and prettiest, garters I could find! So I was thrilled when they offered to partner with me for this review and send me a set! 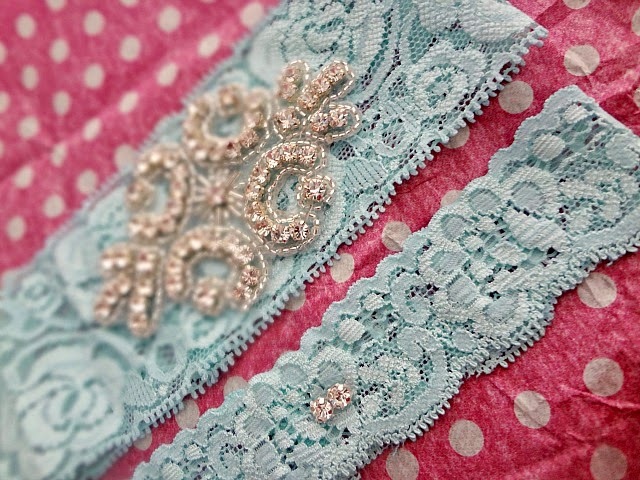 First you have to choose which garter you want-and they have 4 different (customizable) collections to pick from! The least expensive option happened to be my favorite--the Gemstone Glitz collection. 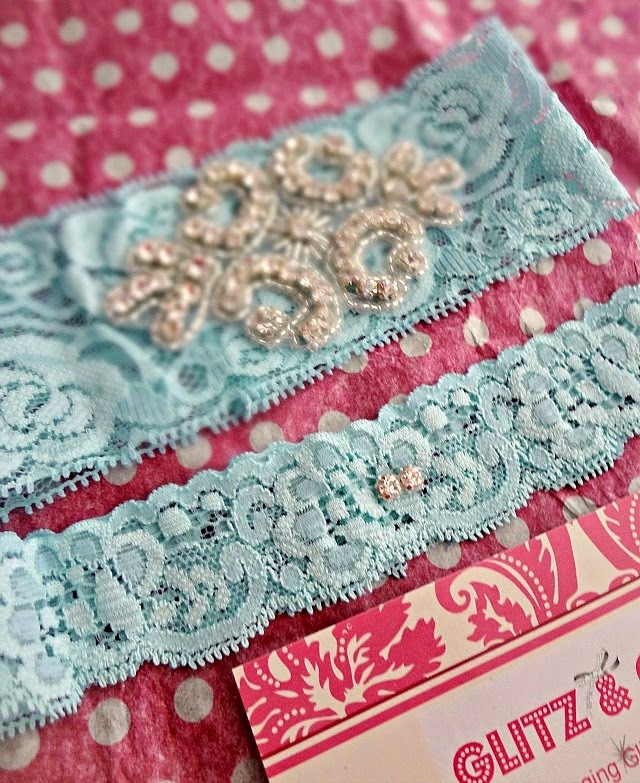 These garters are made of hand dyed, soft, stretchy lace in your choice of color (I went with turquoise--and if you want a color that isn't shown as one of the options, just tell them and they'll dye it to your specifications!) and they feature a rhinestone crest on the main garter (which there are also 3 different varieties to choose from, if you desire) and petite dual rhinestone studs on the toss garter. But if that doesn't full on strike your fancy--maybe you like the stretchy lace but want the rhinestones to actually say something? Then you'll looovee the Say It In Rhinestones collection! Some of the bridal garters say things like "Mrs.", "I Do", "Love" or yours and your fiance's initials. And then the toss garters say things like, "You're Next", or the date or year of your wedding, or just a simple heart. They're a super adorable option! If you like a bit more pizzazz- then the Flowers, Feathers, & Bows garters might suit you best! Set in ivory stretchy lace, this collection boasts embellishments such as peacock feathers, rhinestones and ribbons, and flowers. They're classic, yet fun! And then there's the newest collection-the most extravagant and fabulous of all: Luxe Sparkle! 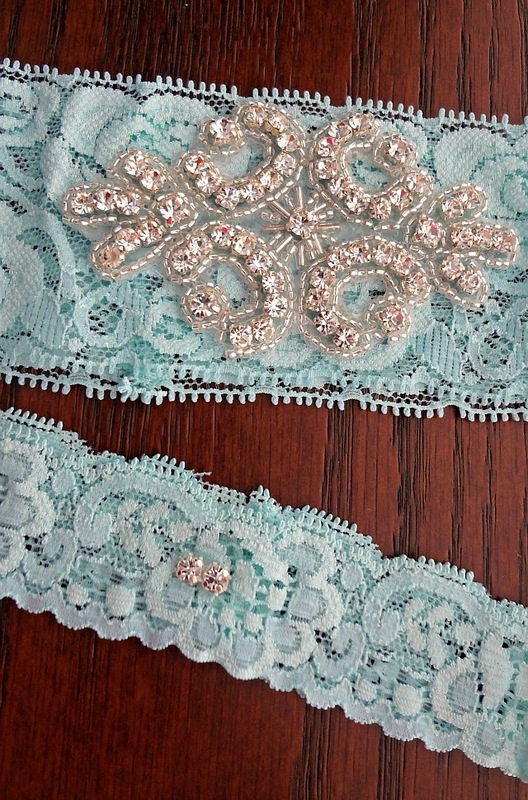 This is Glitz & Garter's newest line and oooh la la do they sparkle! Every piece is pretty much exclusively rhinestones (set in elastic for comfort and finished with a ribbon to tie in the back) and they are seriously beautiful! If I hadn't needed a something blue, I def. would have gone with one of these. Once you've chosen the perfect garter, you have to figure out your garter measurement. Luckily-Glitz & Garters is super helpful! They give a step by step set of instructions on their main shop site, but if you have any questions you can also just message them and they'll walk you through it! I will admit that this part was a bit tricky for me (as I don't have the right kind of measuring tape)--so I actually ended up with garters that were a bit too big at first. But they were really wonderful and sent me a new set that was slightly smaller (truth time: I probably could've gone even smaller, but they'll work!) But it is a hassle to do that so really try to make sure your measurements are correct! And...even if they don't fit perfectly, Glitz & Garters is thoughtful enough to send double sided tape with every garter order to help make sure they stay in place on your big day! One of my favorite things, actually, was the adorable bag my garters were sent in. They're super pretty and-in addition to the double sided tape-they also include a really fun card that gives a brief summary of some cool alternate garter toss activities!! They were things I would never have thought of and I really loved that little extra touch. Moral of the story: my garters are beautiful and I'm so excited to have them as one of the elements of my wedding day. And I'm so thrilled that I was able to discover and share about them with all of you! Disclaimer-I was provided with complimentary garters from Glitz and Garters. I received no monetary compensation and was under no obligation to write a positive review. All opinions are, as always, my own.